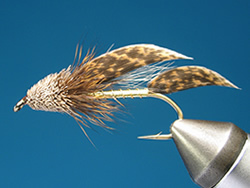 Tinsel bodies are used in patterns, from traditional winged wets, to streamers. The Butcher, Silver Invicta, Muddler Minnow, Kenny’s Killer, Silverside, Lady Iris are just a few. Originally dressed with flat metal tinsel, many patterns now incorporate metallic Mylar instead. 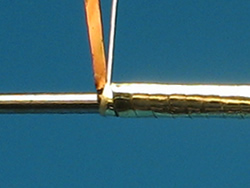 Flat metal tinsel is usually a heavier gauge than Mylar. It doesn’t stretch or mold so has a tendency to sit up and produce more bulk. Metal tinsel also slips easily and is unforgiving of uneven thread bases. Conversely, Mylar is thin gauged, adds little bulk to the dressing, and is stretchy, pliable, and consequently easier to use. Whichever material you choose the following sequence has it covered. 1. Make sure you start with an even base of thread upon which to build the tinsel body. It helps if all materials underneath run the whole length of the body and are kept straight along the hook shank. Where necessary, block out the underbody with extra material to ensure an even profile. 2. 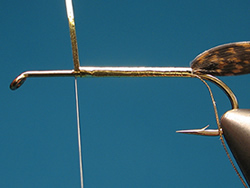 Cut the end of the tinsel to a fine point and offer up to the hook for tying in at the front of the body. 3. Catch in the tinsel by the tip. Keep the tinsel as transverse to the hook shank as possible to reduce the amount it must be kinked to commence wrapping. You can see the inevitable kink at the start of the body in the next photo. 4. Start to wrap the tinsel in the direction illustrated. You are aiming for close touching turns without overlaps. You will see in this illustration that tiny gaps easily appear between successive turns, especially with metal tinsel like that used here. The second layer of tinsel will compensate for this. 5. Spiral wrap the tinsel down to the rear of the body and back again to the tying in point. Again concentrate of trying to keep close touching turns. By wrapping the tinsel in the same direction as the tying thread you will keep the body tight as you tie off. 6. Finally, bring the tying thread up over the tinsel. 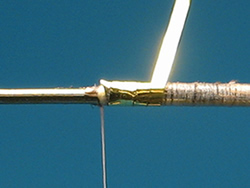 The tying thread should be kept in line with the original tying in point. 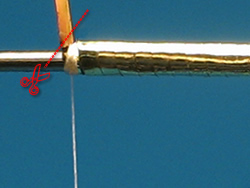 Make three successively tighter wraps of thread (this helps reduce the likelihood of thread breakage on a metal tinsel edge), to lock off the tinsel. 7. Remove excess material by cutting across the flat of the tinsel, otherwise you will kink the end and produce both a potential cutting edge, and a poor base over which to tie subsequent materials like a wing. 8. 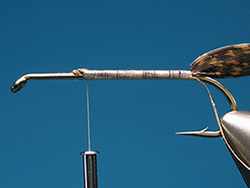 This Muddler Minnow was the working example used to illustrate this article. 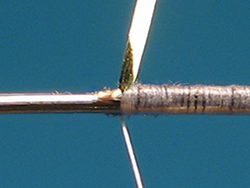 In this example the tinsel body is finished with an oval rib. For a single layer of tinsel follow a similar procedure only start at the rear of the body and wrap forward. When dressing a single layer body, be even more vigilant that you catch in the tinsel with firm thread wraps because there is no overlapping layer to guarantee a secure result. I would advise using 6/0 thread minimum for tying in metal tinsel. Sometimes sharp edges will make short work of 8/0 thread. Something else to bear in mind, besides the contrasting tying qualities of Mylar and metal: Metal tinsels are tough but tend to tarnish, while Mylar is susceptible to wear and tare but is tarnish free. Your choice will depend on how far you bow to tradition and how long you expect a fly to last. 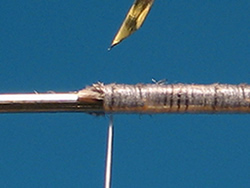 Ribbing and varnishing can help extend the life of a Mylar body……..